Template Gizmos are building blocks that can be used to create beautiful interactive controls for web apps. 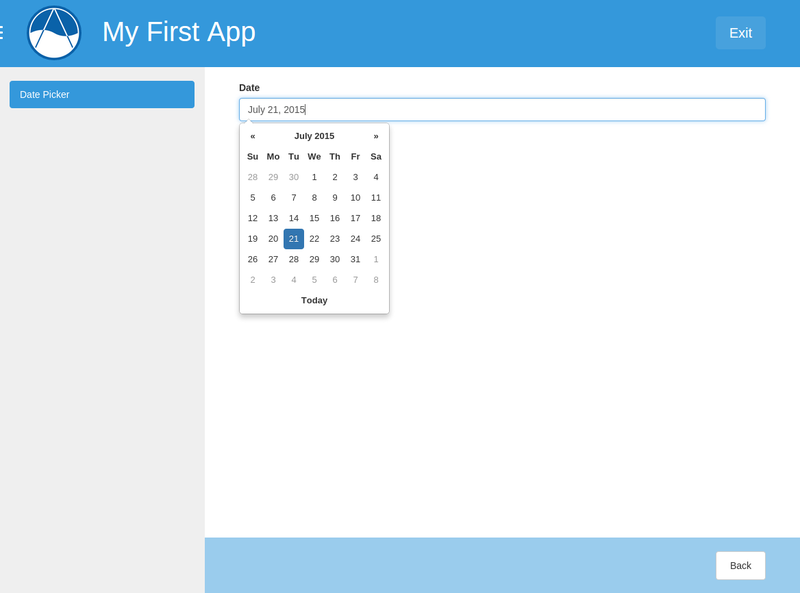 Using the Template Gizmos API, developers can add date-pickers, plots, and maps to their app pages with minimal coding. This article provides an overview of how to use Gizmos. For a detailed explanation and code examples of each Gizmo, see the Gizmos Options Objects section. A detailed description of each step follows. The first step is to import the appropriate options object and configure the Gizmo. This is performed in the controller of the template where the Gizmo will be used. Example of a controller that defines options for a Template Gizmo. The Gizmos Options Objects section provides detailed descriptions of each Gizmo option object, valid parameters, and examples of how to use them. For explanations the Gizmo Options objects and code examples, refer to the Gizmos Options Objects section. This section contains a brief explanation of the template tags that power Gizmos. These are provided by the tethys_gizmos library that you load at the top of templates that use Gizmos. Inserts a Gizmo at the location of the tag. options (dict) - The configuration options for the Gizmo. The options are Gizmo specific. See the Gizmo Showcase documentation for descriptions of the options that are available. Tells the gizmo_dependencies to load in the dependencies for the gizmo. This tag must be in the import_gizmos block. This is useful for pre-loading the dependencies of a gizmo that is not loaded on the initial page load (e.g. : loading the gizmos using AJAX after the initial page load). name (string or literal) - The name of the Gizmo for which to load dependencies as a string (e.g. : "date_picker") or a literal (e.g. : date_picker). You can get the name of the gizmo through the gizmo_name attribute of the gizmo object. This section provides explanations of each of the Gizmo Options Objects available for configuring Gizmos. It also provides code and usage examples for each object. © Copyright 2014, Nathan Swain. Revision 7a6ab284.